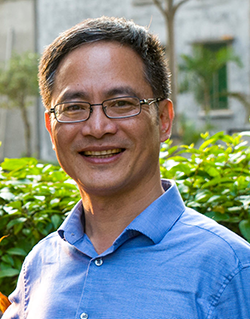 Zhaoqing Yang was named to the editorial board for the Renewable Energy journal. Zhaoqing Yang, a scientist at PNNL’s Marine Sciences Laboratory in Sequim, Wash., was selected to the Renewable Energy journal editorial board. Renewable Energy is a highly ranked international, multi-disciplinary journal. It serves as a peer-reviewed platform and an authoritative source of original renewable energy research. Yang was appointed as an editor of the journal’s Ocean Energy and Offshore Wind section. Yang’s responsibilities include identifying new topics, organizing special issues on ocean renewable energy, making suggestions for improvement of journal quality, identifying reviewers, endorsing the journal to authors, writing editorial articles, and attending board meetings. Yang joined PNNL in 2003, and he holds a joint appointment as an affiliate professor at the University of Washington. His research spans marine renewable energy to coastal infrastructure and ecosystems. Yang leads PNNL's modeling effort on resource characterization and environmental impacts of tidal-stream and wave energy development. He is the lead modeler for PNNL's high resolution hydrodynamic and transport model of Puget Sound. Yang holds a Ph.D. in Physical Oceanography, and master’s degrees in Ocean Engineering and Physical Oceanography.